They say legends never die but Capcom dropped Mega Man Legends like a bad habit, pulling the rug out from under Mega Man Legends 3 and leaving it in a perpetual state of limbo just like the rest of the beloved franchise. (I swear I'm not bitter... But I am also a terrible liar.) There’s been no news of any forthcoming game despite numerous fan petitions and a very clear desire existing in the community. Luckily Sen-Ti-Nel at least recognised the importance of Volnutt and gave us a modern representation of him in in action figure form. Spoiler Alert! 4-Inch Nel Volnutt is at the top of his game as expected from Sen-Ti-Nel. I’ve been an observer of the 4-Inch Nel line so far, with this being my first actual dip into the line. I had ordered X but due to an error on my part the order was cancelled and I’m still trying to find a way to acquire him affordably. Anyways enough about that unrelated nonsense. Let’s dig in and take a look! Sen-Ti-Nel has absolutely nailed the look of Volnutt from Mega Man Legends. I can’t think of anything that they could have improved in terms of aesthetics. They perfectly translated the blocky in game sprite to a beautiful smooth looking representation closer to the concept art of the figure. I suppose it may have looked interesting in a blocky style similar to what Union Creative is doing with their Game Classics series Beat from Jet Grind Radio but I prefer matching the cartoon artwork style. This figure is based on Volnutt’s design from the first game so you won’t be seeing any of the additional armour detailing on his suit or his orange backpack. In keeping with every other Sen-Ti-Nel product I’ve handled, Volnutt is incredibly well articulated and easily posed. The figure is light but very sturdy, and easily balances in even the most extreme poses. Let's go over his articulation from the top down. - Volnutt's neck is made up of a combination of a ball joint with a single axis swivel that allows for a lot of movement in all directions. -He's got ball jointed shoulders that can rotated forward and back with no limitations; they are a bit limited outwards as he can’t achieve a full T pose but utilizing the front and back movement will allow for fairly realistic outward arm movement. Double jointed Elbows with a collapsing hidden second joint. This seems to be a trademark feature of a lot of Sen-Ti-Nel products. I remember seeing this for the first time on RioBot Gurren Lagann and being absolutely blown away. Lastly on the arms he's got ball jointed wrists with the ball joints embedded in the forearm and the hands mounting to a peg. The wrist has a full natural range of movement in all directions. - Mega Man's Torso is made up of a ball jointed torso and separate ball joint ab connection. This double ball peg system allows for a realistic and natural looking ab crunch and waist swivel. - He's got your standard issue ball jointed hips with a great range of movement. Nothing unrealistic but well within the range of a human body. Double jointed knees with the same hidden double joint that collapses into the lower leg armor. Mama-Mia its beautiful! Last but not least we have ball jointed ankles. These are a bit more limited than I would like as they really can’t match the range offered by his hips and knees. A toe joint would have been appreciated. This suite of articulation really allowed me to go wild with almost any realistic pose I could think of and all his joints have perfect tolerance. Nothing is too loose or too tight it’s all just right. Goldilocks would be pleased. There are some instances where his neck articulation needs to be paid attention to while posing as his chin has a tendency to tuck behind his chest armour. Just a simple adjustment will fix it up in most cases. As I stated earlier this is my first in hand experience with the 4-Inch Nel line, but I’ve been speaking with my buddy Kuma Style who has been all in since day one on these figures. He’s told me that Volnutt actually has the least impressive articulation of the bunch! I’m really thinking I missed out by not jumping into this line early on! Check out his site for coverage on the other releases in the line such as X, Classic Mega Man, and Megaman.exe! The 4-Inch Nel line has been consistent in offering a limited suite of accessories with each release. Volnutt is no different. His accessory load out includes a replacement helmet head, 2 replacement hands, his signature Mega Buster, and a standard issue Sen-Ti-Nel figure stand. The helmeted head is a welcome addition though I’m a little bit surprised by its inclusion to be honest. The helmeted look is very rarely seen in any marketing materials and is an optional item that can easily be missed in the video game if I recall correctly. The helmet disassembles and the face plate is interchangeable however I could not discern a difference between the two face plates. Perhaps this will be utilized by accessories included with later releases? One nice side effect of the removable face plate is that the helmet can appear empty and Volnutt can rest it in his hands similar to some of the promotional artwork for the game. 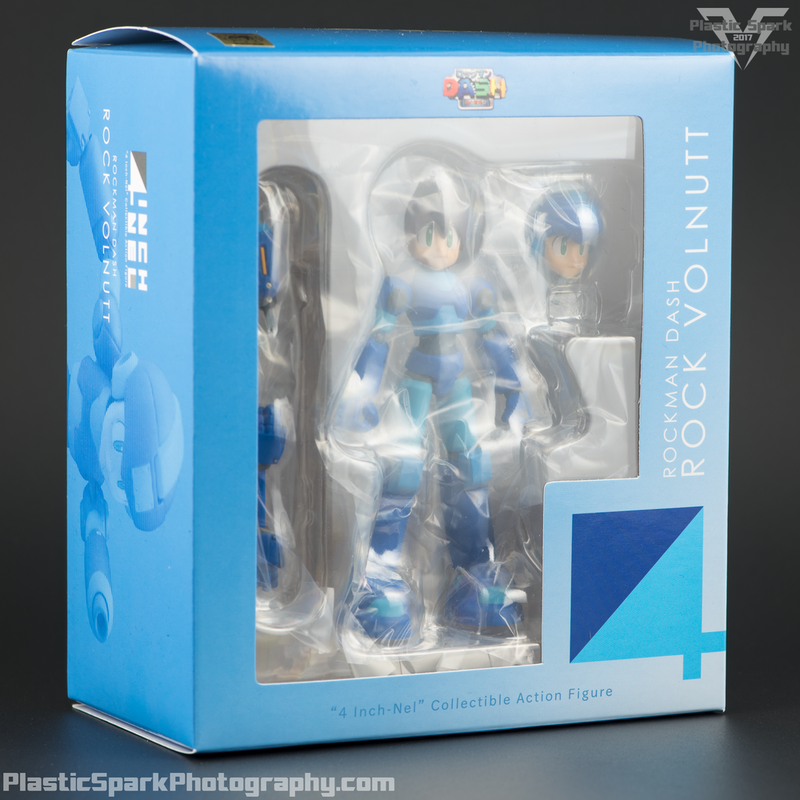 Volnutt comes with the clenched fists attached to the figure in the packaging. The fists are solid with no holes for holding any sort of accessories. The included open palm hands are great for running, dynamic stances, or even more relaxed poses. It’s a really nicely designed multipurpose hand sculpt. Both the fists and open hands also have the armor plating sculpted and detailed on the back of the hand. His Mega Buster is basic but looks just like the artwork with the sculpted yellow power meter on the side. As in the game, the cannon is meant to attach to Volnutt’s left arm so that the power meter is facing outward. It also features the same hidden double joint at the elbow. Let’s play the greed game and talk about what I still wish came with Volnutt. I would have liked to see a couple more accessories despite the lines tendency to be a bare bones release. 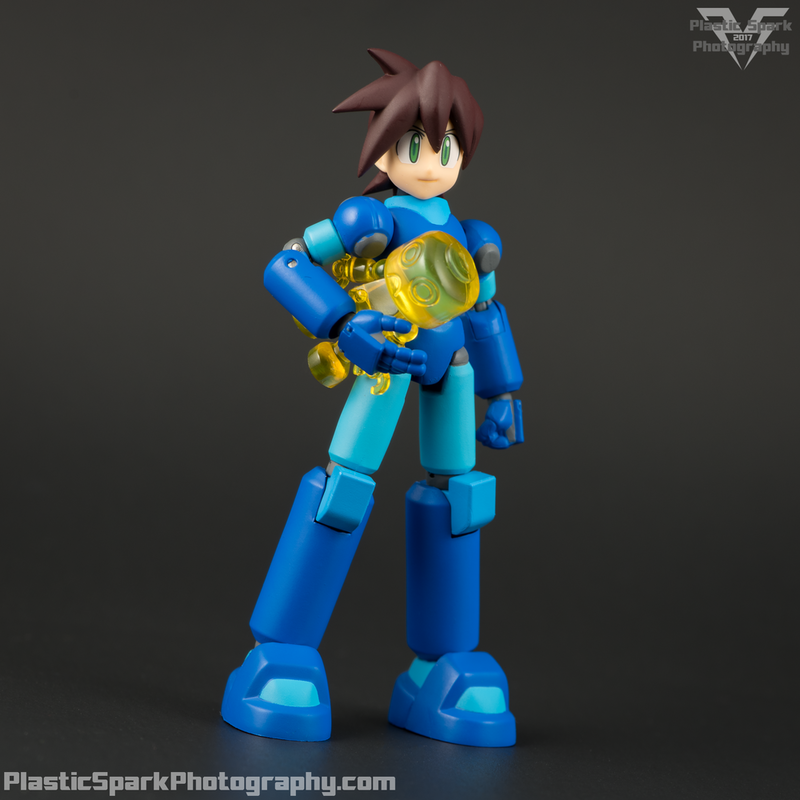 I think they could have easily included the orange backpack from Mega Man Legends 2, allowing this figure to be a fairly accurate representation from either game. Volnutt uses various weapons in the game that actually replace the Buster Cannon on his arm. Including one or two with this guy would have been awesome. Perhaps future figures may come with interchangeable weapons for him? I also think maybe a small Servbot figure, or a soda can could have been a cool inclusion that would mean a lot to fans of the game. 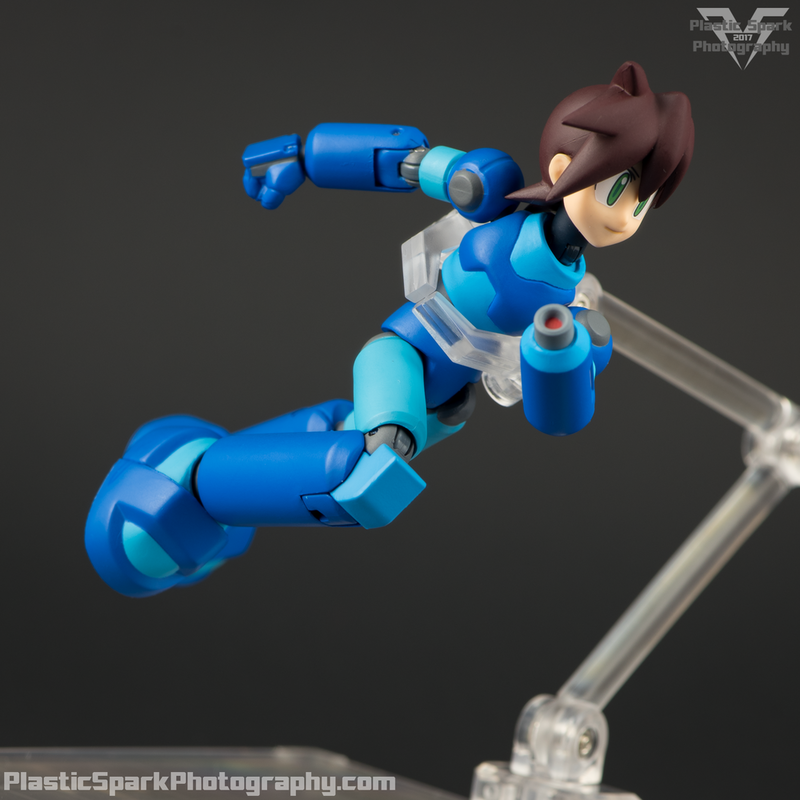 (Luckily for me I had a few items from my 66 Action Mega Man set laying around for these photos.) Lastly, a more exaggerated smiling face, and/or a more aggressive face plate for action poses, Something with a shouting expression or a grimace maybe. I’m still a bit disappointed that this figure included 2 identical face plates instead of some variation. 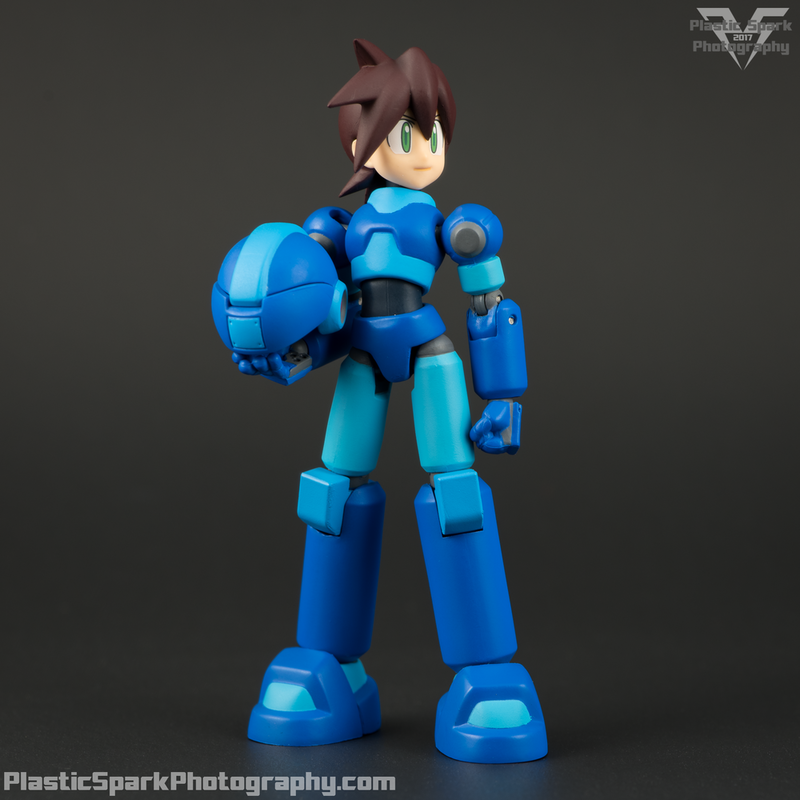 4-Inch Nel Volnutt is a dream come true for Mega Man Legends fans like me. This is a franchise that has been swept under the rug with almost no high quality merchandise available to fans and it’s nice to see a figure of this quality come to pass. Despite his slightly limited articulation in comparison to his line mates I really have no real substantial complaints and I am incredibly satisfied with my purchase. There’s a lot of potential here and I desperately want to see Sen-Ti-Nel continue with this line. The absolute worst thing that could happen is that they give us a hero character with no one to interact with. We’ve seen a few additions to the Mega Man Classic line with the Powered Armor and Rush Jet Mega Man, and even Cut Man! There’s a dark variant of Volnutt, as well as a number of colored variants for Megaman.EXE. Nothing else in the X line up at this time, hopefully that is rectified soon. But most of these are recolors/retools instead of new figures. I would love to see not only the iconic heroes released but to see perhaps some more villains as well. Even if we only get one or two I would appreciate having someone to display these figures with. Give us X and Zero, but also give us some great Mavericks like Storm Eagle and Slash Beast! Give us Elecman and Fireman for classic Mega Man to battle! I know I would absolutely love to see the Bonne family done up in the 4-Inch Nel style to go with Volnutt. Even just a Tron Bonne with a few Servbots would be nice! We might not ever be able to get our boy off the moon… but we can at least enjoy some awesome plastic renditions thanks to Sen-Ti-Nel. 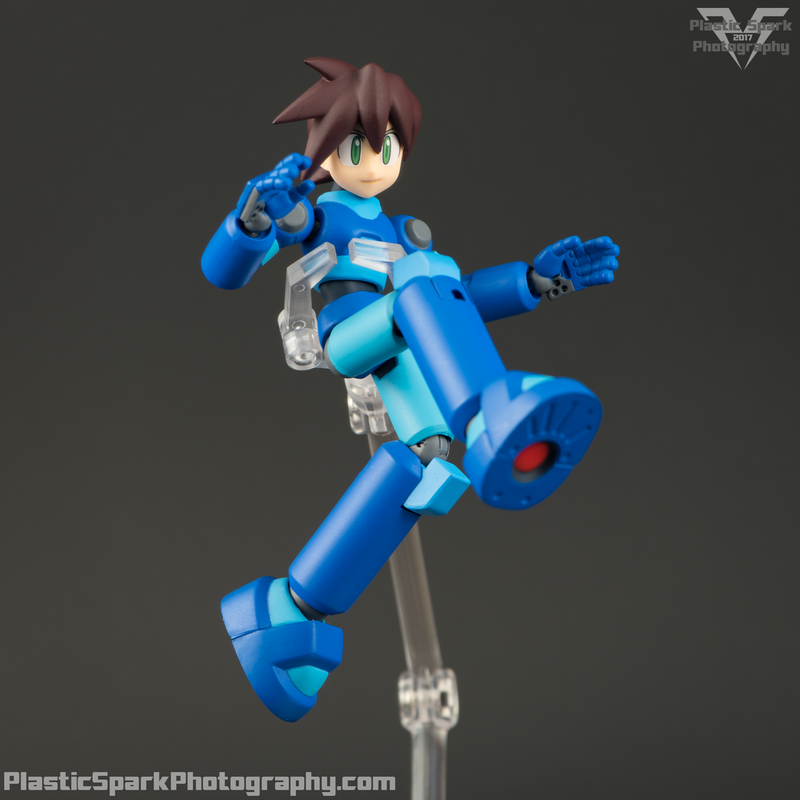 I highly recommend this figure for any Mega Man fan, especially if you are a fan of the Legends series. I really hope we see more for this line as well. Check out the full gallery below for more photos, and don't forget to check us out on Facebook!